There are numerous reasons to visit the Heidelberg area – few, however, are more remarkable than the layers of time and memory still visible on the Heiligenberg or “Holy Mountain”, rising some 439 meters above the river Neckar across from the Old Town itself. There, archaeologists have found remains dating back to Neolithic times, as well as a Celtic fort and burial grounds. Nearby, the ancient ruins of St.Michael’s Abbey contain the foundations of a Roman temple to Mercury, a god identified with the Norse/Germanic Odin or Wotan.There was also a second monastery here, St Stephen’s, given to the University after the Reformation, which then razed it to sell the stones. Many of the remaining stones were reused in the 19th century to build a lookout tower on the same spot as the original monastery and in 1905 a beacon dedicated to Prince Bismarck was also erected nearby. Today, however, the most complete of the structures on the mountain is the Freilichtbühne-Thingstätte, a dramatic amphitheatre/stadium designed by Nazi master-builder Albert Speer and realized by architect Hermann Akker in 1935, built following a period when rightwing student groups organized the notorious burning of “prohibited” books on the Universitätsplatz in 1933. Some 40 such open-air theaters were constructed in significant locations across Germany, to be used for Third Reich propaganda purposes. 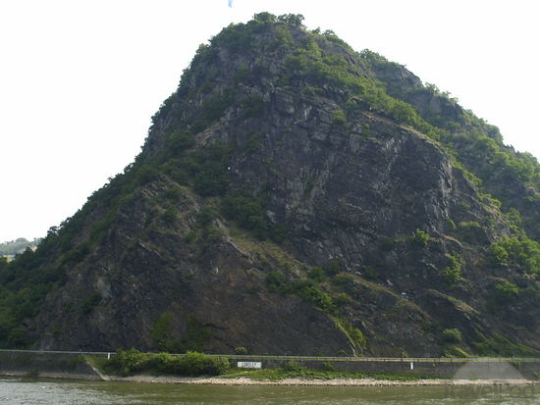 They included one built next to the 1936 Berlin Olympic Games stadium and the amphitheater built on top of the Lorelei Rock,on the River Rhine, positioned to face the sunrise. The Nazis were thus reviving what they imagined to be a truly Germanic way of living and celebrating, based on sun worship with several of the structures aligned to the rising or setting sun. “My father, then aged 8, stood outside our building as one of a long chain of young torch bearers”, reminisced an affable hotelier I once met there. “It was June 22nd. Dr. Goebbels himself arrived to give the opening speech, timed for the summer solstice. The line of torches stretched from the old city, over the Karl-Theodore bridge and all the way up the Philosophenweg to the top of Heiligenberg. There, the torches surrounded the newly built amphitheatre”. A French writer of the time had stated bluntly that “Fascism is Theatre!” and this certainly illustrated how important that concept was to the Nazis. Said to originate from early Viking democratic assemblies, The Thingstätte at Heidelberg was an idea of Joseph Goebbels to counter the influence of Christian Churches. Hitler saw Christianity as a threat to the national-socialist regime, so new ceremonies needed to be invented. This was endorsed by Himmler who considered the main task of his elite SS was to be prepared for an ultimate clash between “humans against subhumans”. A crowd of some 20,000 people gathered on the 56 rows of seats and around the theatre slopes to hear Goebbels, the Minister of Propaganda, speak to the crowd. He compared the Thingstätte amphitheater to being “like the Autobahn, National Socialism in stone!”. It then opened with a Summer Solstice celebration that included a musical cantata by Franz Philipp called “Heiliges Vaterland”(Holy Fatherland). The acoustics were excellent and still are today. Various staged events took place there over many months, before the Ministry of Propaganda dropped the “Thing” Movement by 1937, to concentrate on the Albert Speer-staged and rather Wagnerian Nuremberg Rallies.These were filmed and movies like Leni Riefenstahl’s much acclaimed “Triumph of the Will” disseminated their triumphant message in cinemas instead. The Nazi ideas were then efficiently reinforced through the radio broadcasts that were such a daily feature of the Third Reich. After the war, and 20 years spent in Spandau prison, Speer moved back to Heidelberg and lived in a villa above Heidelberg Castle. His son was also an architect but the two were estranged until his death in 1981 in London. He was on his way to a BBC interview on his bestselling autobiography. To his death, Speer always denied knowledge of the Holocaust and is said to have donated a good part of his publishing income to charitable Jewish institutions. The stadium-theatre he designed in Heidelberg remained in use for many more years – hosting events which included several organised by the US Army, an unofficial “witches” night every April and for high profile concerts – the most successful of which was possibly the electronic group Tangerine Dream, leading exponents of the so-called Krautrock movement. The tranquil views over the beautiful Neckar valley would alone make a journey up the Heiligenberg worthwhile, but the unforgettable forest setting and the meaningful ruins and monuments make a visit particularly rewarding.